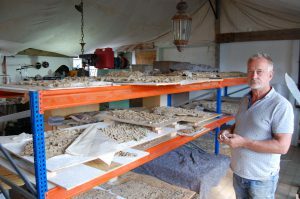 Conservation archaeologist Chris Cleere ups sticks next month, when he relocates from Rye to Majorca. 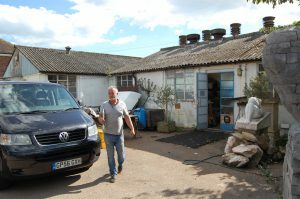 His workshop at the Creative Centre, New Road, Rye is due to be demolished shortly by East Sussex County Council, but that is not the reason for him moving. Fascinated by the history and technology of windmills, he has bought one called Moli D’en Portella at Santanyi on the island of Majorca. He intends to restore this to working order in a project that he accepts may take many years. To help finance the project, he will be opening a gallery/antiques shop in Santanyi next year. His project has attracted much attention and he as been invited to speak at the XI International Molinology Conference which will be held next month. Meanwhile, he has work to finish off in Rye. He has undertaken the conservation of a tessellated pavement from the site of a Roman villa, found “somewhere in the West Country’”. He declined to be drawn as to a more specific location. The process of conservation involved the application of a non-woven synthetic fabric to the face of the tesserae and then carefully cutting into 30 or so sections, following the lines of the design. These sections are then lifted and turned upside down to allow the backs of the tiles to be cleaned and treated. Following conservation, the pavement will be consolidated on aluminium panelling for display in a museum. He admits this will also take some time to finish, so he’ll be coming back to Rye quite a few times yet. Image Credits: Chris Cleere, Kenneth Bird.